March 23 is National Puppy Day, a day to promote puppy adoption from rescues and shelters (and look at cute puppy pictures and videos on the internet, of course). If you recently added a new puppy to your pack, here are some things to know about your puppy’s emotional health. It’s widely recognized that puppy socialization involves meeting new people, other animals and being introduced to new locations and objects so that the puppy isn’t fearful later in life. 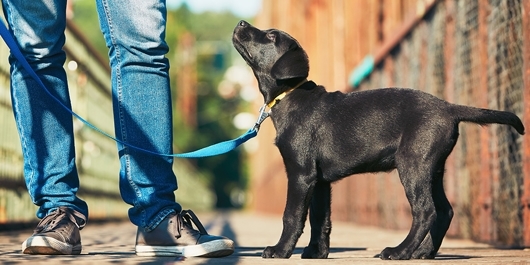 Often pet parents focus on the physical nature of socialization like taking their puppy to pet-friendly stores, letting their puppy play with other dogs and handling their puppy’s feet, mouth and body. These are all important parts to a puppy’s development, but did you know that training also plays a vital role in supporting your puppy’s emotional growth and development? As a puppy parent, your role is to help your puppy learn how to thrive in a new home, communicate safely and effectively with you and other animals, and become comfortable with potential stressors they may face as a dog in today’s world. 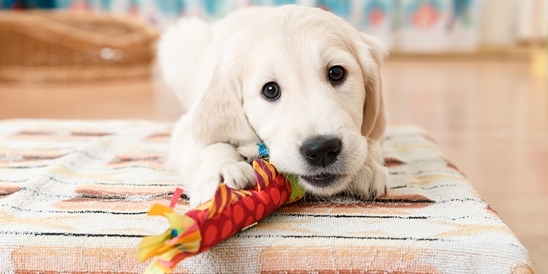 Here are a few key training areas to focus on to boost your puppy’s emotional well-being. Puppies are in a prime developmental period to learn new behaviors! Teaching your puppy basic cues will help support the socialization process, give you and your puppy a way to communicate and support your puppy’s confidence. Basic training is also a great mental exercise that not only tires your puppy out but teaches problem-solving skills and increases cognitive development. This has shown to decrease stress levels in dogs as well. Starting young and keeping up with training throughout your pup’s life is vital to preventing unwanted behaviors. Dogs are social creatures and typically prefer to socialize with humans and other animals. While we want to establish a bond between you and your puppy, your puppy also needs to learn independence to avoid developing separation issues that can cause undue stress and behavior problems like barking, anxiety or destruction when left alone. Separation-related disorders are a common issue among companion dogs and affect a dog’s stress levels. In addition to meeting a variety of humans, it’s important to introduce your puppy to objects, places, smells and sounds. This desensitizes, or slowly introduces a puppy to stimuli in a controlled manner within their fear threshold. Creating new sensory experiences also aids in problem-solving behavior and decreases stress levels when a puppy is faced with a challenge. This form of desensitization also diminishes the likelihood of phobias, fears and general anxiety from occurring during adulthood.